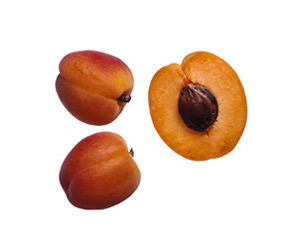 Apricots are most familiar as a dried or canned fruit. But it’s the delicate flavor, sweet aroma and downy skins of fresh apricots that make them the golden gems of the stone fruit family. Botanically related to peaches and about the size of small plums, they bruise more easily than other stone fruits and are usually shipped unripe to prevent damage during transit. California grows over 90% of U.S. apricots with their season running from late May through August. So, don’t procrastinate when you see them at the market. Pick some up this summer to enjoy in desserts, salads, hot off the grill or eaten raw as a sweet juicy snack. Select fragrant, plump apricots with velvety golden skins that have no tinge of green color. Handle gently to prevent bruising. Avoid any that have whitish spots, blemishes or cracks and are either too firm or too soft. Store the unripe apricots in a paper bag at room temperature for 3 to 4 days. Once ripe, use immediately or refrigerate in a plastic bag for only 1 to 2 days. Apricots dry out very quickly under refrigeration. Gently wash apricots under running water just before using. Because their skins are so thin, they are rarely peeled. To remove the pit, cut around the seam to the pit with a sharp paring knife. Twist gently to separate into halves, then pull out the pit with your fingers. Use fruit immediately or brush cut surfaces with lemon juice to prevent the flesh from turning brown. Preserve fresh summer apricots to enjoy all year round by turning them into homemade jam. Poach in fruit juice or white wine and serve alone or over ice cream, pancakes or pound cake. Grill fresh apricot halves to serve alongside grilled poultry or pork. Toss thinly sliced apricots into green or fruit salads. You can layer yogurt, chopped apricots and your favorite cereal in a glass for an easy breakfast parfait. Top BREAKSTONE’S Cottage Cheese with sliced or chopped apricots. Substitute sweetened apricots for strawberries in summer shortcakes. Use alone or with other fruits in tarts, cobblers and crisps.